Now how cute is this!! The adorably wistful face, the lovely blue and pink shading and the cute little button flowers on her skirt - just too, too cute! 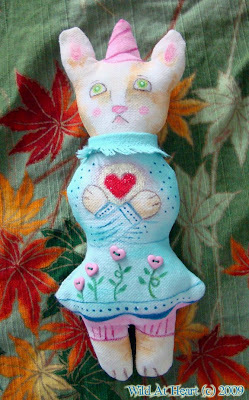 This little cutie was created by Zan Asha. your hope is so sincere ... I'll be one less trying to win the little gem (been sitting under the lucky star a bit too long ...) ... here's wishing YOU are the lucky one!